Calder ‘76 boss Rob Kenworthy has set his side a second target - to finish above Hebden Royd Red Star this season. Calder hit top form with a 5-1 win away to double cup semi-finalists Warley last Saturday. 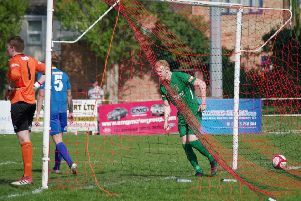 That prompted the manager to add to his long-standing goal of 29 points for the season, which would be a best for the club under Kenworthy in the Halifax AFL’s top flight. It looks a tall order to catch Star but Calder still have nine games left, including four against bottom three sides and a return date with Red Star. Max Crossley missed a good chance for the visitors before Jonny Gibson opened the scoring on 20 minutes. The dangerous Damian Nichol equalised with a superb volley but Allen restored Calder’s lead before half time. Ricky Topham penalty on 55 minutes virtually killed the contest and Calder powered clear through impressive Ben Fairburn’s fine free kick and Allen’s second near the end.